Dr Lomax is very attentive, long story short he listens to what the patient is saying in real time and basedupon what he is hearing(because he is listening) he will attempt to fix or solve the reason for your visit with him that very day. Dr Lomax is very conscientious. Dr Lomax is very attentive, long story short he listens to what the patient is saying in real time and based upon what he is hearing(because he is listening) he willattempt to fix or solve the reason for your visit with him that very day. Dr Lomax is very conscientious. As my first visit to receive a second opinion the Dr was cognizant of my desperation to find answers to mysituation. And though it seems hopless the Dr never faltered in treating me with the utmost dignity and respect in pursuit of an answer. He was complementary to my last ENT DR and never spoke negatively and promised futher follow thru by himself or his staff. As my first visit to receive a second opinion the Dr was cognizant of my desperation to find answers to my situation. And though it seems hopless the Dr never falteredin treating me with the utmost dignity and respect in pursuit of an answer. He was complementary to my last ENT DR and never spoke negatively and promised futher follow thru by himself or his staff. PLEASE ADVISE: All patients MUST include Insurance Provider and Insurance ID# when scheduling. If you do not include this information, your appointment will not be confirmed. Dr. Randall S. Lomax earned his medical degree from Des Moines University – College of Osteopathic Medicine and Surgery, graduating in the top 5% of his class. Dr. Lomax fulfilled his clinical rotations in Cleveland, Ohio, under the direction of Ohio University - College of Osteopathic Medicine. He completed his general surgery emphasis internship followed by an Otolaryngology/Facial Plastic Surgery residency at Des Peres Hospital in St. Louis, Missouri. 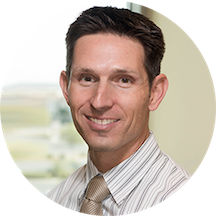 Dr. Lomax received his undergraduate degree in exercise physiology from Brigham Young University in Provo, Utah, with a minor degree in Italian language. A native of Salt Lake City, Dr. Lomax decided to return to the western half of the United States to open Advanced Ear, Nose & Throat – Head and Neck Surgery. He has been married for 18 years and is the proud father of two children (a son and a daughter). He enjoys spending time with family, being outdoors, and cheering for the St. Louis Cardinals. Caring for Kids From Summerlin Hospital 2015 "No more sinus infections"
As usual Dr.Lomax was very professional and forthcoming with his information. I appreciated his attentiveness to my concerns. Everything went great. Getting an appointment took forever though, took over a month to see him. Great. Took care of my needs. Dr. Lomax is very professional. He explained fully my situation and options available. Had to wait 25 minutes to see him, but you can expect the wait time with good doctors. Highly recommend. Dr. Lomax was great with me. He did solve the problem I had, answered all my questions. Seemed to listen to what I had to say. If he did not know the answer to my question, he would admit he didn'tknow, which is hard to get a lot of doctors to do. Would recommend. I was very happy with my visit with Dr Lomax. I was really impressed with his level of empathy he showed in regarding to my condition. He listened to everything I had to say and responded in a constructive way. Thank you for the great visit. This was the first time that I saw Dr. Lomax. The wait time was extremely long to see the provider and I had to check with the Receptionist to see when it would be my turn with the provider. I wasglad to get out of his office after being there for several hours and growing tired of sitting in the waiting room. The wait was long, but worth the it because once in I felt like the Dr. really listened to me. He showed me test results and reviewed them with me ensuring that I fully understood. He then made sure that my future care is secure. I was very pleased with Dr. Lomax and his staff. The office was very neat and orderly. Everyone was organized and very pleasant. Dr. Lomax was very nice and was easy to communicate my issue with him. I would highly recommend him to anyone in need of an ENT. The wait time in the exam room was a little longer than I prefer, but not outside the norm when compared to other specialties. I was really pleased that all my exam needs were completed in a single visit. I retiredfrom the medical field after 20+ years, and I know that the first impression on arrival can make or break whether a patient ever comes back again or makes referrals. The entire staff beginning with the receptionist, and ending with Dr. Lomax was professional, polite, and congenial. It will be my pleasure to recommend this great office. Thanks everyone ?? Very knowledgeable and personable. Makes the visit better by taking time to connect with his patients. I’m very impressed with his professionalism and customer satisfaction. ?????????? Three out of our six family members have seen Dr Lomax and he is fabulous. Wonderful doctor who takes his time to explain things. He’s the best!!! He listens and always takes the time to go over everything with me. Wouldn’t want anyone else. The only reason I wasn't called right away when I got there was because I was a new patient and had to fill out papers. I enjoyed the staff, and Dr. Lomax was very nice. He tried to answer all my questions, and was very thorough. Dr. Lomax was my daughters surgeon today. He is wonderful. Dr Lomax did an Adenoidectomy on my son Parker. His office wait times are long but a skilled Dr and Surgeon are worth any wait. I recommend him highly. I believe Dr Lomax is an excellent doctor. I trusted him completely. And I would recommend him highly. As always, he's simply the best! As a flight attendant, he is always available for me and my ears! The best. Had polyps removal surgery and now follow-up! Completely cured. Amazing doctor, personal and kind person. Highly recommended! It was my first appointment with Dr. Lomax, and the paper work extended my wait time. He and his staff were most professional. Dr. Lomax displayed a very professional and reassuring exam for my complaint. I would certainly return and recommend him to anyone in need of an ENT physician. The doctor and his staff were very courteous and professional. Dr. Lomax was very professional. He listened to my concerns and then created a plan. Office staff was very efficient. Would definitely recommend him. Dr. Lomax was thorough and professional in his evaluation of my case and provided clear, understandable reasons for his decision to observe my case and not proceed with surgical procedures until further information is developed. I found himto be concerned, considerate and moderate in his handling of my case. I was already impressed with the fact that his staff had responded to my oncologist's referral and identified an opening in his busy schedule to fit me into with as little delay as practicable. Very professional handling of the referral in all aspects. Dr. Lomax was great! He cleaned my ears efficiently and even talked with me about my sinusitis. The staff was professional and Dr. Lomax was kind and explained everything that he was going to do before the procedure and during. I felt that I was in good hands. Dr Lomax is the best! He listens carefully and one never feels rushed or shortchanged. All of my visits with him have been exceptionally satisfying. The best! Excellent doctor and kind person. Jasmine was the best. Wife called and explained to Jasmine the issue I was having and she was able to get me in right away. Dr Lomax was great as was the DO. I highly recommend Dr Lomax. Staff was great. Dr. Lomax is such a nice man. Very thorough, very smart. Receptive. To the point. He is a caring, soft spoken Dr. He could be one of the most thorough doctors thatI know! He has a great manner and takes the time to answer any questions you may have. I highly recommend Dr Lomax! He isa very knowledgeable doctor! If you need an ENT doctor, Dr Lomax is the one to see!! Dr. Lomax is always very professional and he is one of the most caring doctors I have seen in a long time... highly recommend him. His staff was very professional. He was pleasant and informative.